["official" for 2014, short lived] Now technically Nick found this product last May, but it wasn't on the 2013 press release and I didn't see it until early 2014. Well, it's on the new products press release for 2014 and Wells was nice enough to send over a free package for testing. Snack Size? Hmmm. Well, technically their ice cream bars are also "snack size" so as to differentiate them from the full size bars you might find at a convenience store. Doh! 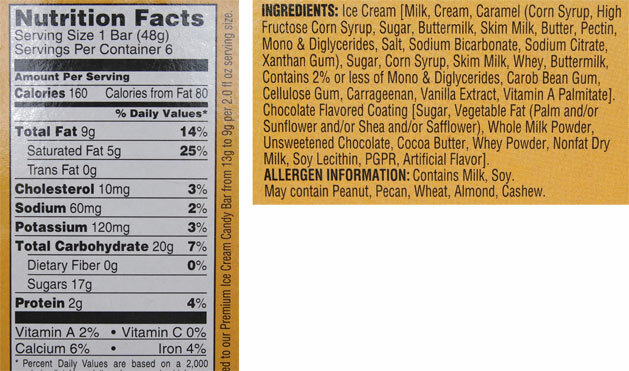 That reminds me that we never tried the Blue Bunny Caramello Ice Cream Bar. I actually snuck one of these in during a break from recording episode 27 of the nosh show and I will admit that I made short work of it. I wasn't wowed, but I wasn't disappointed either. It's a fine product, I just didn't get that same flavor intensity that I might get from a snickers or milky way ice cream bar. On Second Scoop: Fast forward to the weekend and it's time for a photo session and I can't do that without sampling some more product ofcourse. I like these, I do. Yes I wish there was more caramel sauce to make me really think I'm getting a candy bar, but all the components themselves are fine. The shell is fairly crunchy and a bit thicker then any of the Mars branded ice cream bars. You know what? 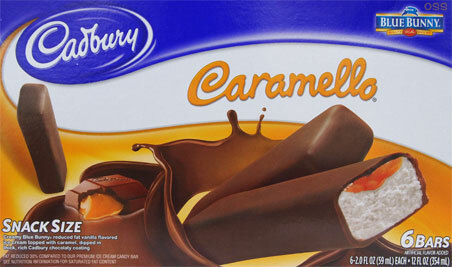 I should have bought a Caramello bar for this review because I really can't remember the last time I had one. On Third Scoop: Try to let the chocolate shell melt on your taste buds a bit as you take each bite, it helps wrap things together a bit better and makes you appreciate the bar more.